Below are the all-time best marks in the state of Arizona for high school boys. A special thanks to Coach Jeff Guy (Desert Vista/Ultimate High TC) for contributing and maintaining this list. On this list there are records older than my father (1958, shot put) and records that were broken just last year. We certainly hope to see a record or two fall this spring. After a quantum leap in the 800m last spring and briefly being the nation's fastest 5K runner last fall Carlos Villarreal might have a chance to challenge Bernie Montoya or Billy Orman for some distance records, though it will be tough. Carlos runs in Division 3 for the state meet, and will look for competition necessary to push him to those times at larger meets. Boy's races tend to be dominated by upperclassman so look for this year's rising seniors to make some noise. 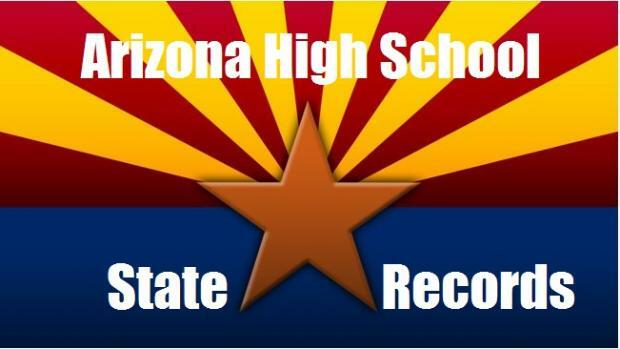 Stay tuned to Arizona Milesplit for updates throughout the spring! Dallas Long North 1958 69'3.00"
Dwight Johnson Tempe 1987 67'0.50"
Larry Hendershot Washington 1962 65'6.00"
Jim Camp Paradise Valley 1982 64'11.50"
Brian Muir Sunnyslope 1979 64'5.00"
Dwight Johnson Tempe 1987 212'11"
Jim Howard Arcadia 1971 201'7"
Doug Reynolds Greenway 1993 200'9"
Aaron Corcoran Maryvale 1992 197'3"
Mike Talbot Agua Fria 2002 196'6"
Bryce Lamb Chandler 2009 25'10.75"
Lamonte King Dysart 1977 25'9.75"
Travonn White Mountain Pointe 2013 25'5.50"
Dannie Jackson Santa Rita 1975 25'0.5"
Larry Reed Yuma 1967 25'3.50"
Bryce Lamb Chandler 2009 52'6.25"
Will Claye Mountain Pointe 2008 52'4.75"
Hayden McClain O'Connor 2013 50'8.25"
Aaron Fox Sinagua 1994 49'1.00"
A.J. Cornelius Kingman 1995 48'9.50"
Gabriel Beecham Casa Grande 1989 7'2.00"
Donavan Fields Mesa 1981 7'1.50"
Teddy Williams Cactus 1990 7'1.50"
Phil Feinberg Corona del Sol 2007 7'1.00"
Nick Hysong Tolleson 1990 17'4.50"
Scott Marshall Desert Vista 2013 17'1.00"
Garrett Starkey Basha 2012 17'0.00"
Grant Sisseron Horizon 2013 17'0.00"
Cole Walsh Brophy 2013 16'9.00"